To those of you who don’t watch supernatural: It is brilliant. If you can live through the first two seasons you are never going to be able to stop watching it. Also, it is about two brothers who work together (and sometimes with help) against monsters that most do not recognize exists. Just so you know, for the murder mystery I am about to give you. 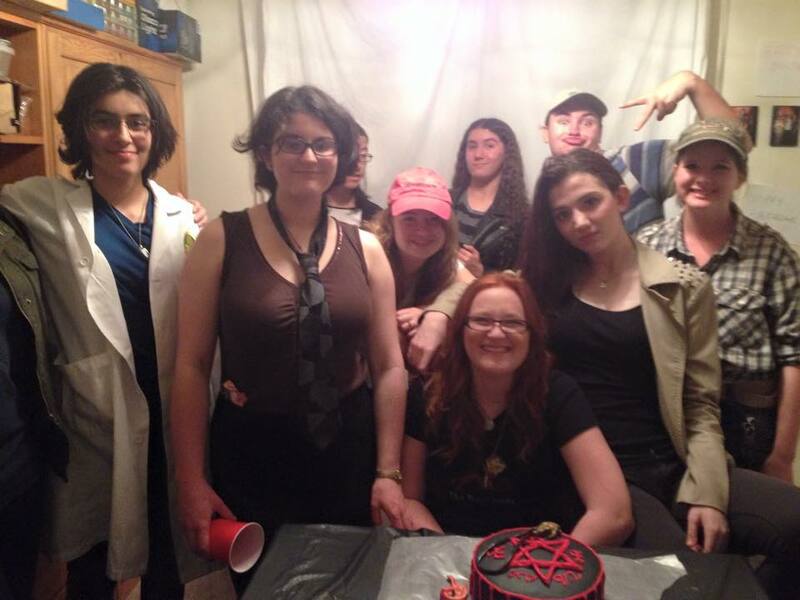 So, I decided to invite my guests with direct instructions to dress up as their favorite character from Supernatural that was not Sam and Dean (or if they weren’t acquanted with the characters, a classic monster of their choosing) and tell me as soon as possible. Knowing who everyone was was vital, as it helped my mom and I choose what the murder was going to be and the spoken evidence we could give to point to multiple people, that could only be narrowed to one. My awesome friends and I. We began by giving the guests character sheets. I made these by copying and pasting the wiki-page for each character, making it look awesome and printing it out. If you have interest in the example one below, feel free to email me and I can share the other character’s information sheets. Once everyone had their sheets, we spent around an hour walking about in character and talking to others in character to see who would have a problem with who and what they are capable of. After we felt we are ready, my mom came in and ‘told a story’. In the story, she talked about a man in his early twenties found dead in his house. She made it clear there was no blood, but he was crumpled by his chair and the only thing out of the ordinary was a slight smell of sulfur and a tuff of fur. This hair could be nothing big though, as this man was a hunter. This was the part that confused the guests slightly. Was he a monster hunter, or was he a deer hunter? And the sulfur? A demon had to fit in there somewhere. They discussed which of them it would be most likely. If there was no blood, it was not a violent death, and therefore, many of the demons of the party were thought to be out of the picture, although there was a sulfur smell. They then reached the conclusion that it would be unlikely to be an angel as well, seeing as they would almost have to burn the victim’s eyes out to kill him. And it they were not convinced death would murder someone. And what about the motivation? A bit later, after we had discussed the first set of data pretty thorougly, and had even come up with a few ideas of how the murder may have occurred (the most creative being something on the lines of Ruby or Crowley using witchcraft and him somehow getting poisoned but not vomiting up teeth) but they were having a difficult time explaining the fur and the sulfur at the same time. It wasn’t until mom came down with the second ring of evidence that they began piecing it together. When mom came down, she informed the group that there was a white powdery substance found on the ground that the lab was attempting to identify, a wad of a couple hundred dollars and some drugs. She also told us that lab results came back, and there was not a trace of drugs or poison in his system. Bobby, Samandriel, Death, Gabriel could definitely not do it. They didn’t have the power to force the victim anywhere without physically injuring them, or it wasn’t their forte. Abbadon, Ruby and Crowley were all old enough and picked up quite a bit of power and witchcraft over time, so it was possible, but didn’t explain the fur. Bella deals with magical items all day, and might have found something or another to force the victim into an interrogation but she never would have left the money. Lucifer is strong enough, but would have had to left a mark and what about the fur? And that left the answer: Garth. Garth was probably off being retired when he caught whiff of demon in town and decided to go take care of it. The man is possessed by a demon (sulfur), so he traps the man in the devil’s trap (substance on floor), does an exorcism, but loses control and becomes a werewolf (leaving the fur). Or, as they put it, he didn’t lose control and had a tuff of fur on his jacket (he is a werewolf, after all). The money and drugs are from the man before the demon possessed him,as he was a drug dealer. He had likely been dead for a while though, because when Garth got rid of the demon, he was already dead. So that was the murder mystery. We had tons of fun doing this. 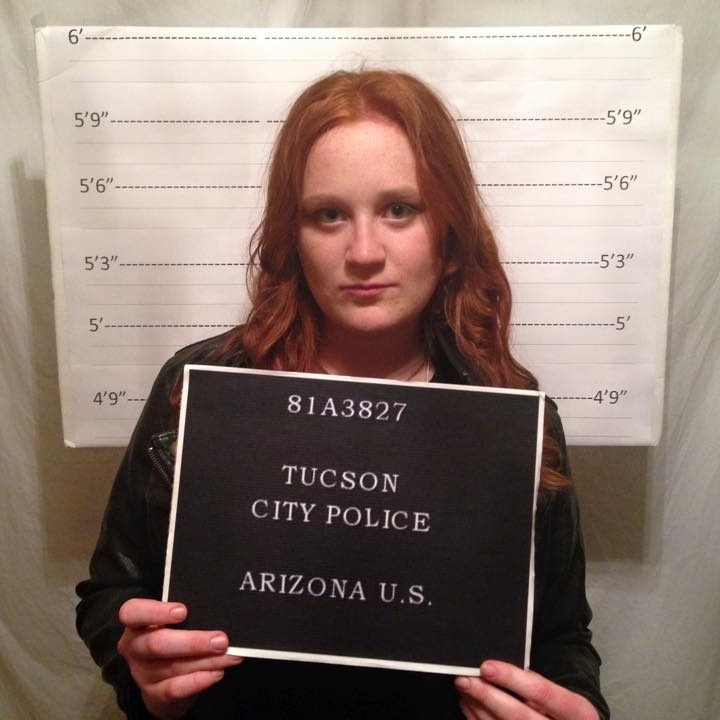 After the mystery, we did mugshots and I handed out FBI badges I created for each individual guest. So yeah. 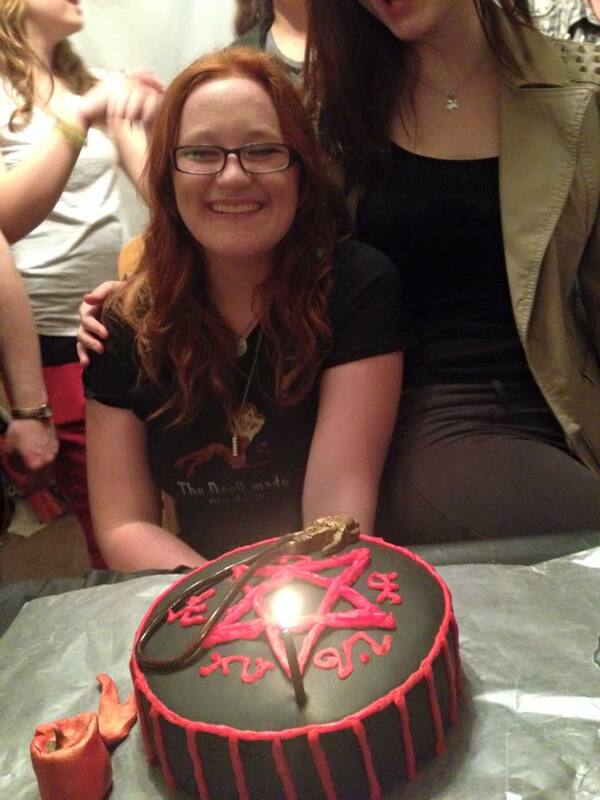 My mom made an awesome cake, I have awesome friends and even though Castiel couldn’t make it, I had a great time. (And he made it up to me later, we went to the planetarium).